Let me tell you about a little treasure hunt we went on to find a hidden letter in Edinburgh. 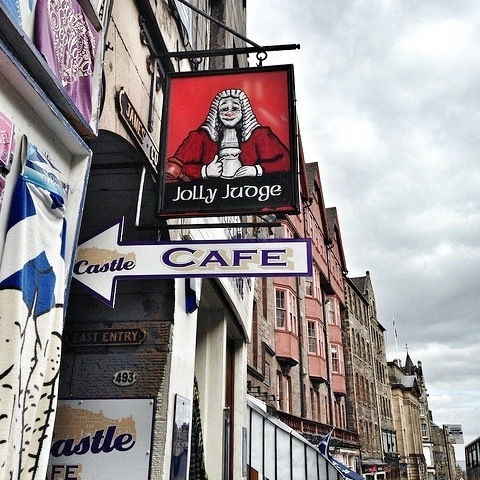 Almost as soon as we arrived in Edinburgh a few weeks ago, Cole and Mary Polly were insistent that we find a place called the Jolly Judge. While Taido seemed to understand their need to find this spot in the city, I remained completely oblivious until we were actually on the Royal Mile. We had walked from our apartment and turned onto the top of the Royal Mile. We were just beginning to take in the view of Edinburgh Castle, which until now, we had only glimpsed from afar, when Taido and the kids started to run in the opposite direction down the street. Puzzled, Mother and I followed and barely caught up with them in time to see them turn down the alley (or close, as they are called here) underneath the sign for the Jolly Judge. They were all down on the ground searching the wall of the close. They were all shouting. Taido pulled out pieces of folded up paper from the wall and when we opened them all up, to our delight, they were letters to our family. A little note for each of us. A girl from our hometown, named Ashley Jolly, had visited Scotland with her family in June, and though she knew we weren’t moving to Edinburgh, she figured we would get there eventually, so she wrote letters and hid them in a wall for us to find when we arrived. Your letter is in the wall, near the Jolly Judge in Scotland. You can’t believe how much fun this was to all of us! We read her letters over and over and Instagrammed pictures of finding them. I would have to say it was one of our highlights of our time in Edinburgh, and it was such a simple, fun idea. It made me curious. Have you ever left a letter hidden in a city for a future traveler? Or have you ever found one? We are all thinking now about how we might leave someone a letter like this some day! That would be incredibly fun to find notes in a wall! My kids would LOVE that! Well, I would too!! What a cool idea! it was so wonderful to meet you at TBEX, Alison, & hope to catch up with you again, here or in Scotland! So great to meet you as well, Susan and I look forward to our paths crossing again! Are you going to WTM in London? I’m thinking about it. Wow, what fun! A mystery and a scavenger hunt all in one! I know! I hope to hear more stories of other folks doing something similar! What a fabulous idea-and adventure! I know, right? Put it on your list to leave someone a letter sometime! Ashley is a very clever person. What fun I know you had. i adore this! great idea. love! This is an amazing story, Alison. Really neat. Thanks Leigh! So much fun! I LOVE this, what an amazing thing to do for you!! I know, right? SO sweet!